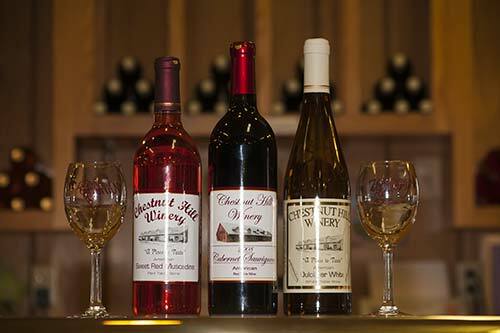 2000' feet above sea level, the "Chestnut Hill Winery" is "The Place to Taste". The winery has a fermentation capacity of over 23,000 gallons, making it one of the largest wineries in the state of Tennessee. Fermentation takes place in stainless steel tanks and all wines produced are bottled on the premises. While visiting ask for a tour of the winery. We want your visit to be enjoyable, memorable, and educational. The best and most enjoyable way to shop for wine is to visit the winery in person. 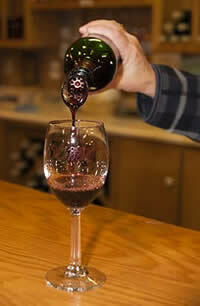 When you visit the Chestnut Hill Winery, be sure to have a taste of the wines. Stroll through the unique gift shop with mostly Tennessee made items. Chestnut Hill Winery also has "Gifts to Go"; these gifts are wrapped and ready, waiting for you to pick up. Cabernet Franc: A full bodied red wine with ripe, rich, dark red fruit flavors. Pairs well with pork, lamb or beef. Merlot: A dry, full bodied red wine with just the right mouth feel and nose, aged in French Oak giving this wine its smoothness and taste. Red Onyx: A blend of 4 different wines which smooths the flavor for a wonderful mouth feel and just the right taste. Mandolin Blanc: A unique twist to an old favorite. This clean, crisp, dry white wine has just a hint of oak to smooth the taste. Similar to Sauvignon Blanc and Pinot Grigio. Chardonnay: A crisp white wine, a hint of oak with a buttery finish that is appreciated by everyone. Try this with white sauces, grilled chicken or fish. Dulcimer White: A nice semi dry white wine with just a hint of sweet to tantalize your taste buds, Riesling and Gewurztraminer fans approve. Riesling: A fragrant semi dry with notes of citrus, very smooth wine to enjoy as a social drink or with your favorite meal. Pairs well with chicken, sea food and pork. Southern White Muscadine: Made from the famous Southern Muscadine grape, this full-bodied desert wine is wonderful with sliced apples and pears, or poured over vanilla ice cream with fresh strawberries. Sweet Red Muscadine: Also made from the Southern Muscadine grape. Like its sister Sweet White Muscadine, excellent with ice cream and your favorite fruits to tantalize your taste. Fiddler Red: Made from the famous Concord grape this wine could be drank for breakfast. Following our line of instrumental wines you will agree that Fiddler Red is not only tasting with great Concord aroma but also a taste that can't be beat. Enjoy this wine as a social drink or an after dinner drink. Volunteer Peach: Made from a blend of several different wines with the natural peach flavoring added. Enjoy the fresh peach aroma before you refresh your palate with this with wine. Enjoyed as a social drink or after dinner. Try pouring some over vanilla ice cream and you will find the taste will be amazing. Hillybilly Shine Wine: "Not to be mistaken for your grandpa's elbow medicine" this wine is sure a hit. We blended just the right wines together and added the natural watermelon flavoring to create one of the finest wines in our sweet line up. You will love the creative label and the festive watermelon flavor. Give it a try you won't be disappointed. Blackberry: This wine is one of our best sellers. Known for its great blackberry flavor and smooth finish you'll come to love it. Another blend of wines with the natural flavoring added to create the perfect balance of grape and blackberry. Chocolate Covered Cherry: ​(Seasonal) Little bit of Chocolate, little bit of cherry, excellent for holidays, and pretty too.